Delivers an ultra clean laminar airflow over the working bench to protect manipulated products from dust, from environment contamination and from cross contamination in the working area. 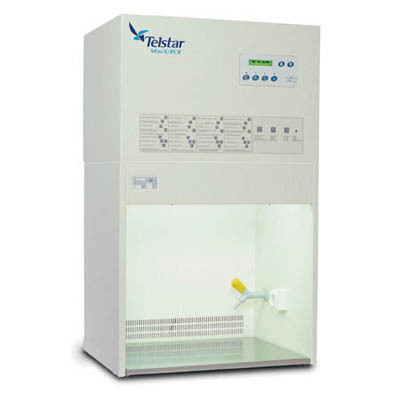 Telstar™ Mini-V/PCR includes a built–in UV light with timer is particularly suitable for PCR process to denaturate oligonucleotide contaminants. Compact dimensions compatible with all laboratory doors and dimensions. Epoxy powder coated finish zinctec steel cabinet. AISI 304 stainless steel work bench. H14 HEPA filter with 99,999 % efficiency for particles >0.3 micron easily accessible for replacement. Prefilter 85% ASHRAE, in the inlet side. Class 100 work station according to Fed. Std. 209 and BS 5295. Incluye Sistema de control electrónico con pantalla LED, luz fluorescente, luz UV integrada con temporizador, toma eléctrica en zona de trabajo, mesa de trabajo de acero inoxidable.